Why should there be only one way of displaying visually the message of Christmas? Jesus grew up among sheep, and took a special liking to them. He referred to their life and habits in parables. Thus, why couldn't we imagine him being a young boy cared for by his mother and protected by a friendly herd of sheep? Or did he grow tired and sleepy from counting sheep? Saint Joseph, somewhat stiff and out of his depth as amateur herdsman, is watching over them all. 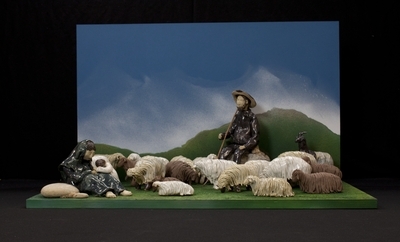 Set of glazed, handsculpted ceramic figurines depicting the nativity of Jesus, created in Switzerland by Franziska Torti-Roten. Exhibition label originally written by Fr. Johann G. Roten, S.M. for exhibit entitled "At The Manger" and held at Roesch Library, University of Dayton.